Jack Richeson Sketch Drawing Clip Board, 11 x 17"
Hole on back of clipboard for wall hanging. Material Redi Rite Clipboard: clipboard by Saunders is manufactured with high-quality recycled aluminum. Ensures a lightweight construction. Provides corrosion resistance. Grey colored clipboard. Fits paper sizes upto 5.75 in 9.5 in (14.61 cm 24.13 cm). This clipboard is made from sturdy plastic. KPL282 - PINK. The quantity/color might be different from the title. We also provide expedited service at a low price. This is the full-size, slim-profile locking storage clipboard. New Gear: If you’re not satisfied, neither are we. It’s that simple. Sturdy Low Profile Clip. Transparent and Colorful Mix Set. We also provide expedited service at a low price. Retractable Hanging Hook For Easy Display. the quantity/color might be different from the title. Keep paper in easy-to-read, upright position. Color : Navajo sand. We want you to be totally satisfied with your order. Product Image. This clipboard is made from sturdy plastic. the quantity/color might be different from the title. We also provide expedited service at a low price. Hardboard clipboard allows you to write in comfort without a desk. Secure your papers with the stainless steel clip. Marketing Information Hardboard clipboard allows you to write in comfort. Board Material Hardboard. This clipboard is made from sturdy plastic. the quantity/color might be different from the title. We also provide expedited service at a low price. KPL282 - BLUE. This clipboard is made from sturdy plastic. NURSING CHARTS AND PAPERS NOT INCLUDED . the quantity/color might be different from the title. We also provide expedited service at a low price. KPL282 - Blue. Nursing Clipboard with Backside & Inside Quick Access Cheat Sheet. 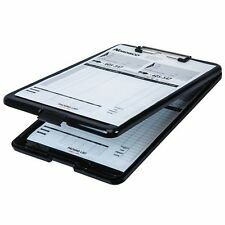 With a Clinical Reference Material Our clipboard is full of reference and cheat sheets to help you stay organized and. Excellent for use during clinical rotations. Custom made, exactly what you see in the picture, works good for pocket or purse, keeping notes ready to write on close at hand. 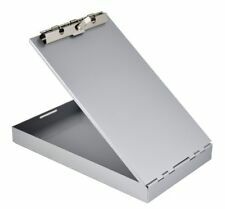 Pen Holder clipboard has a smooth surface and edges with rounded corners. Flexible pen/pencil holder - Fits many writing utensils - Black ink pen pictured included. Craft: powder coating. Depth of Pencil Cup: 10.5cm/4.1”. Holds your stationeries in place without sliding due to the bottom pads. Size of Drawer: 12.5x11.6x5.7cm/4.9”x4.6”x2.2” (L×W×H). Everything is Kept in the Original Factory Sealed Box. Manufacturer Part Number 01863. Manufacturer Sparco Products. Clipboard provides a stylish, functional way to write when you're on-the-go and working without the convenience of a desk. 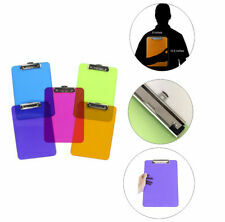 Clipboard is made of durable molded plastic for lasting use. Trending at $5.85eBay determines this price through a machine learned model of the product's sale prices within the last 90 days. 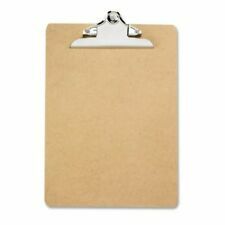 Hardboard Clipboard. Standard size hardboard clipboards are made of durable, long-lasting materials. Low Profile Clip. Rubberized clip corners for a more secure grip - Holds up to 80-100 sheets of regular paper. Dual-function clip lets you slide in up to 5 sheets one-handed or securely clip up to 30 sheets. Swings forward and back for easy viewing and storage when not in use. Mounts right or left with Command Adhesive. Key-hole on the back enables the clipboard to be hung on the wall. No local pickup. Brand New Original! A Form Holder Ready When You Are! Your item will have a unique old fashion look and feel. Wanting a rustic installation of photographs?. 2 3/4″ (W) x 1 1/2″ (H). Aker Double Citation Book Holder Plain Black Leather. Condition is Used. Shipped with USPS. Craft: powder coating. Depth of Pencil Cup: 10.5cm/4.1”. Holds your stationeries in place without sliding due to the bottom pads. Clipboards have smooth surfaces and edges with rounded corners. Durable hardboard construction - Holds over 80-100 sheets of regular paper. Retractable hanging loop - Stows away when not needed. 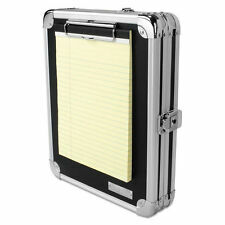 6 Pcs of Letter Size Clipboard Low Profile Hardboard (9" X 12.5"). Top load, aluminum clipboard with steel clip holds. The solid construction provides a smooth hard writing surface for making lasting copies. Perfect for right handed or left handed users. Sturdy Low Profile Clip. Combination of folder and cover clipboard. the quantity/color might be different from the title. Standard Size: 12.9' H x 8.9' W. We also provide expedited service at a low price. Durable and Used with long service life ahead. 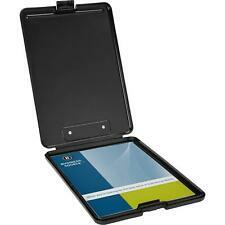 Perfect for securing and protecting sensitive information. A shoulder strap is included as a comfortable carrying option. The key-hole on the back enables the clipboard to be hung on the wall. The writing surface is very smooth. This storage organizer will resolve all isuues. 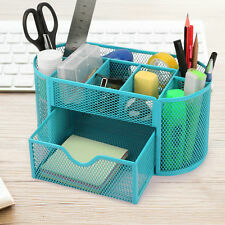 Make the most of your space and find urgent things effectively with this desk organizer. SIZE:L W H: 23 11.5 11. Have you agonized for the chaotic office tools ?. Saunders Aluminum Clipboard Storage Box Redi-Rite RR-8512. Good pre-owned Condition; this has lots of scratches but no dents, please see photos. Still lots of life left! Perfect for when you are working out of your vehicle. This style has a top hinged opening and latch at the bottom. 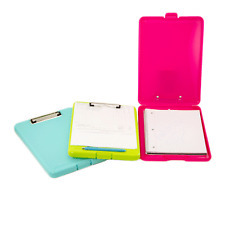 12" x 8 3/4" x 1 1/2" interior paper storage 1 1/2" x 8 3/4" x 1 1/2" internal storage spot for pencils & pens exterior dimensions approximately 14" x 9"
Set of 4 Standard Size Arch File Cover Folder Clipboard Colorful Mix Assorted Colors. Combination of folder and cover clipboard. The quantity/color might be different from the title. Standard Size: 12.9' H x 8.9' W.
Lot of 12 pieces. New in Box. Dual-function clip lets you slide in up to 5 sheets one-handed or securely clip up to 30 sheets. Lets you slide in up to 5 sheets one-handed or securely clip up to 30 sheets. Sheet capacity: 30 sheets. This Organizer Is New & Factory Original! JAM Paper Aluminum Pad Holder - 9 3/8" x 11 7/8" - Silver - Sold individually. Can be refilled with a standard size pad. Color: Aluminum Pad. byJAM Paper. 9 3/8" x 11 7/8" x 1/4". Quantity: Sold individually. This clipboard is made from sturdy plastic. the quantity/color might be different from the title. We also provide expedited service at a low price. 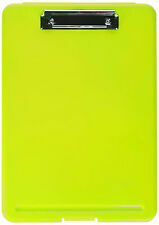 KPL282 - Green. Craft: powder coating. Depth of Pencil Cup: 10.5cm/4.1”. Holds your stationeries in place without sliding due to the bottom pads. Size of Drawer: 12.5x11.6x5.7cm/4.9”x4.6”x2.2” (L×W×H). 10 count of handmade once fired 9mm brass push pins. 【Lightweight Design】SUNNYCLIP places a high priority on the convenience of this job clipboard, for better experience, this enclosed clipboard is especially lightweight with only 1.4 lbs. The sealed storage box efficiently protects your files safely. The Trade Quest letter size faux leather clipboard is made of durable, long-lasting materials that are perfect for your every day needs. 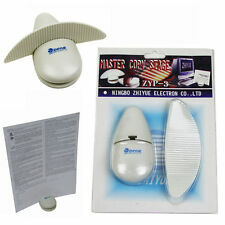 Ideal for schools, offices and home. The polished metal clip is sturdy with a strong spring for a more secure grip. Our boards are shipped in an efficient non-retail box and each board has a protective bag to ensure it arrives safely without blemishes. Trade Quest offers a a 100% satisfaction money back guarantee.